Normally when you press and hold the sleep button on your iOS devices, you will be greeted with a simplified “Slide to power off” message and sliding on the bar will put your iOS device into power OFF mode. How nice could it be if users can get more options rather than just a simple OFF button which could be too limited. If you are looking for a tweak to achieve more options for selection, here is the simple tweak from Cydia that you can try. 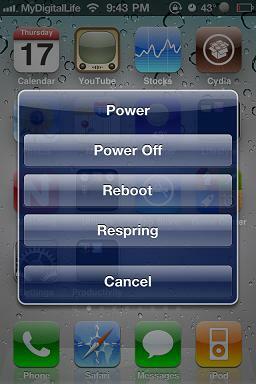 Head over to Cydia, then search for PowerUp under Search option. Download it and follow by Springboard restart and you are done. While it doesn’t seem to be really useful for some users, but this is definitely a good tweak for those that would prefer more options than conventional menu. Furthermore, the tweak is totally free for download from Cydia (with condition that you have your IOS devices jailbroken) so do try it out yourself at no charge.